The second ITMA ASIA + CITME 2010 exhibition was successfully held on June 22nd to 26th. Shrugging off the effects of the economic downturn, the combined show at the Shanghai New International Expo Centre (SNIEC) is grossing over 100,000 square metres. Suntech displayed their latest Big Batch Fabric Inspection Machine model ST-BM-01. This machine is driven by centre-drive system with constant fabric tension during fabric checking, especially good for delicated fabrics. In addition, it uses touch screen instead of the traditional control panel for operation. The customers from Morocco and Peru were interested in model ST-BM-01 Big Batch Fabric Inspection Machine and placed the order on site. 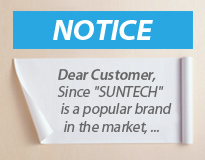 Suntech’s Material Storage & Handling Equipments series also entered rapidly into the overseas markets.